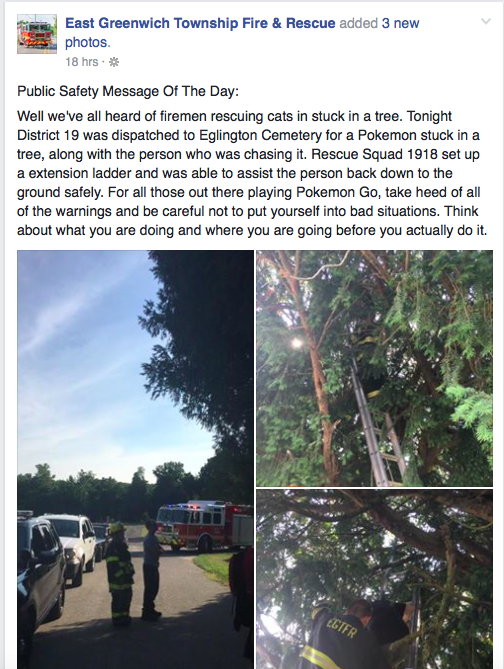 Women rescued from tree at Eglington Cemetery in East Greenwich, New Jersey on July 19 2016. About two weeks into the Pokémon Go frenzy, many of us have been driven up a wall and out of the tree, so to speak. There was a time when people deliberately used to say Pokeman just to infuriate the game's most avid fans. Today, these same snide critics are running around with smartphones looking for dozens of virtual characters when the only one absolutely worth it is Psyduck. Pikachu would have been a lights out second, but he's in the doghouse for conduct unbecoming of Pikachu at last night's Phillies game. There's no need to pour hate on Pokémon Go. It's a phenomenon of mass hysteria the likes of which we haven't seen on this scale, for a positive reason, in a very long time (unless you count the Chewbacca mask video). If this is what lifts the boat for Nintendo to consistently produce great gaming experiences in the future, it's well worth it. 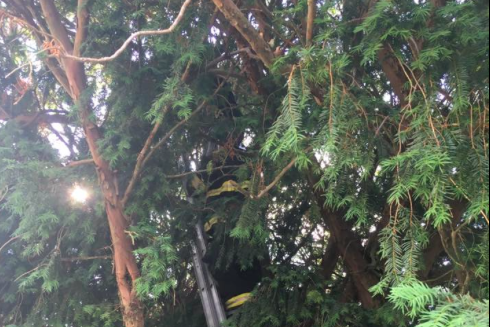 One thing that definitely wasn't worth it was a New Jersey woman's climb up a tree at Eglington Cemetery in East Greenwich Township on Tuesday night. Local firefighters were none too pleased. Facebook post on July 19, 2016. In case you're beginning to wonder how long this can possibly last, the International Business Times is here to provide the appropriate buzzkill.